Thinkspace (Los Angeles) – is pleased to present new works by Curiot in Warped Passage, opening May 28. Michoacán artist Favio Martinez, known by his pseudonym Curiot, currently lives and works in Mexico City. Raised in Costa Mesa, California, the artist relocated to Mexico, following his completion of high school, hoping to reconnect with his estranged cultural roots. He completed his BFA at the Universidad Michoacana in 2008 and since then has continued to hone his unique aesthetic in both his ambitiously scaled site-specific public mural pieces and his gallery works. Renowned for his experimentally surreal and colorfully vibrant imagery, Curiot creates visual worlds with an anthropological suggestion. Simultaneously ancient and contemporary, they’re inspired by Mexican folklore, handicraft traditions, textiles, and patterns. His larger-than-life sensibility often borders on the abstract, as he combines the human and the animal into awe-worthy aggregates. Ambiguously totemic and ancestral, the works have been known to explore the primal coexistence, and contention, of the human and natural worlds. An advocate for the preservation and respect of this tenuous balance, Curiot has created a mythological shorthand with a wealth of characters and recurring symbols, immediately recognizable as his own. In this new body of work, Curiot explores transition and metaphysical passage, working intentionally within a loosely defined future tense. 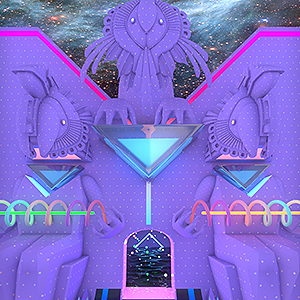 In this dizzying new quasi-futuristic realm, the mythological creatures of his self-devised mythology have passed on, transmogrified, and are reincarnated as depictions of deities and icons for worship. Exploring both loss and expulsion, metamorphosis and inheritance, Curiot offers a labyrinthine splitting of worlds and paths. Act 1: Warped Passage will feature a collection of new paintings, two new digital editions, an adventurous installation component, including musical accompaniment from Franz (Pira MD Records) as well as an offsite mural completed for the RFK Schools project via Branded Arts.